Dumpling King satisfies my love for dumplings. 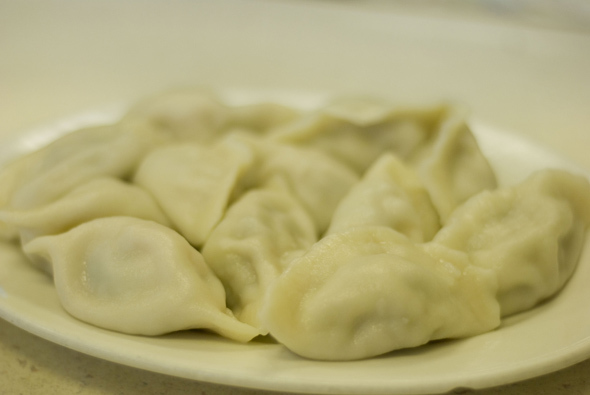 These precious little flour pockets cater to all different tastes and offer wonderful variety -- there are veggie-filled dumplings, meat-filled dumplings, seafood-filled dumplings, and if you're looking for a more well-rounded meal, there's even the three-in-one dumpling! 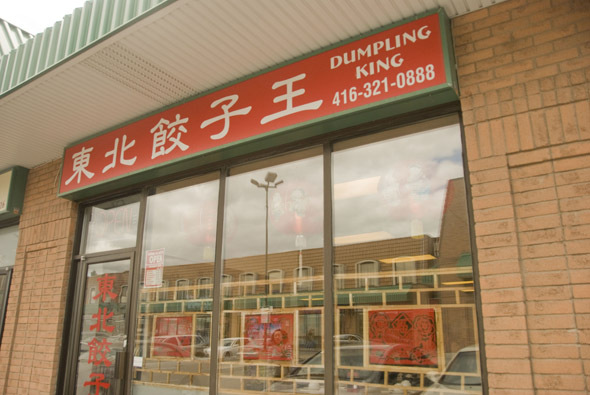 If for some odd reason you're not feeling the dumpling fever, Dumpling King also offers noodles, rice, seafood, vegetable, meat, cold dishes and desserts to choose from. Our party of two chose the boiled (steamed or pan fried options are also available) leek, shrimp, and pork dumplings (12 for $5.99). Service was efficient, the food came quick, and was consumed even faster. Served with a choice of black or red vinegar for dipping, the dumplings come well packed (i.e. not to tightly), which let us easily identify the fresh ingredients. The shrimp was wrapped whole inside the dumpling, which is pretty impressive. Also excellent was the hot soup explosion, coming with enough heat and anticipation that I burned my tongue on the first bite. Next were the cold noodles with sweet and sour soup ($5.99). 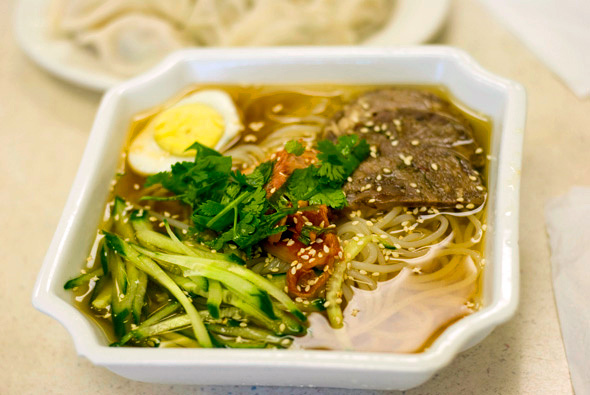 This dish comes with parsley, kimchi, a hard-boiled egg, beef, cucumbers, sesame seeds, and of course, noodles. The noodles were different -- semi-clear and slightly chewy. But overall, they were a nice and refreshing balance of sweet, sour, and garlicky flavour, comparable to the Korean dish of naengmyeon . The third, and only disappointing dish, was the sticky rice ($3.25). 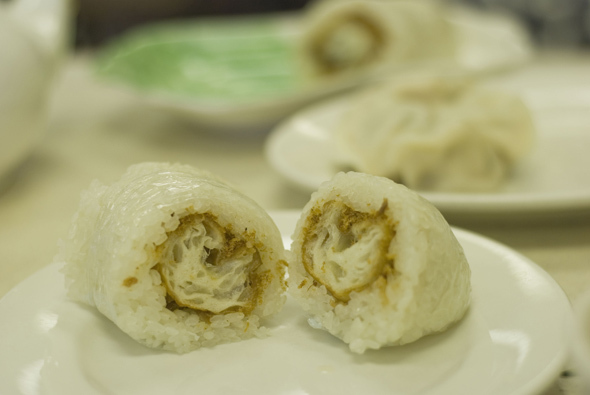 I'm a big fan of dough fritters and dried, shredded pork, and this combination of fried dough, preserved veggies and shredded pork, wrapped with steamed sticky rice is usually a hit with me. In this case, however, there wasn't enough pork, and the fried dough tasted too crunchy and dry - like it was fried multiple times. According to their website , their head chef hails from ShenYang province in China and serves the best Imperial cuisine in the country. 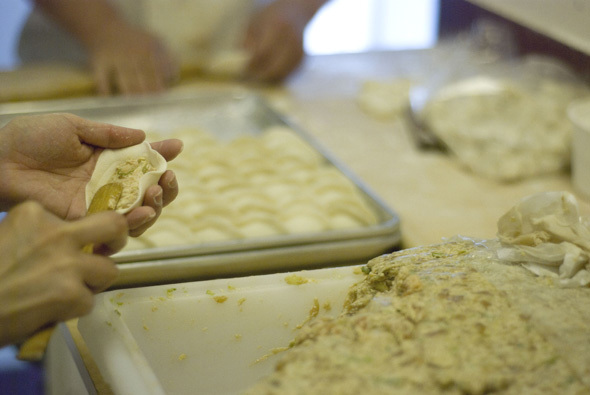 We saw flour-covered staff at the back, deftly rolling out round discs of dough, transforming it in a few hand motions to rows and rows of neatly wrapped dumplings ready for customers to enjoy. With decent service, cheap prices and (mostly) delicious food, Dumpling King is certainly worth a try.